We have reached the best time of year, when we can look to the future with hope. We can stop wondering what will happen in 2018 and look forward to 2019. The investment industry always does this enthusiastically, as you will see in forecasts everywhere the next few weeks. Not wanting to be left out, or leave you wondering what I think, I usually review several other forecasts and later add my own. This year, I’m turning that sequence around. Recently I did a “2019 Investment Outlook” webinar with my business partner Steve Blumenthal. So right or wrong, my thoughts are now on record. In this letter, I’ll give you an abbreviated version of that webinar and add a few other thoughts at the end. Then in January, I’ll spend a letter or two reacting to other interesting forecasts. But first, I am going to offer some different thoughts than the mainstream media spin on Jerome Powell, his press conference, and the Federal Reserve. My inbox and the mainstream media are packed with criticism of Jerome Powell’s press conference. The market didn’t like what it heard and immediately tanked. People called him tone deaf for not listening to the market. Looking at US-based indexes, and indeed most foreign ones, we are clearly in bear market territory with many benchmarks down well over 20% from their highs. What was Powell thinking? There were many accusations that Powell fumbled the ball, not telling the market what it wanted to hear. As if that were his job. I think Powell may have said exactly what he wanted to communicate. The last three Federal Reserve Chairs have acted like the Fed has three mandates: the two official ones (low inflation and full employment) and an unofficial third one: making sure asset prices rise as the market wants. Not just the stock market, but real estate and all other investment assets. It started with the Greenspan “Put” which morphed into the Bernanke Put (remember the taper tantrum?) and reached its apex with the Yellen Put. And what did we get? A series of bubbles. As Stan Druckenmiller says, the really big Fed mistake was when Greenspan kept rates too low for too long in 2003–2004, setting up the housing bubble and Great Recession. He clearly helped the massive bubble in 1999–2000. Then Bernanke’s reluctance to raise rates above zero in 2012–2013, when the economy was manifestly recovering, refueled the asset price bubble. Yellen continued that course. Her reluctance to raise rates until Trump won the election, the economy was booming, and unemployment clearly falling was inexcusable. I think there is the very real possibility Powell wasn’t being tone deaf at all. He could have wanted to remind everyone that the Federal Reserve is independent from Wall Street as well as politics. Yes, Powell worked on Wall Street, is quite wealthy and was an investment banker, and even ran his own hedge funds, as well as numerous posts for the Treasury before he came to the Fed, so he is clearly an “insider.” He is also wicked smart, maybe even wicked brilliant. He didn’t stumble or mumble at his press conference. He was quite deliberate. He knew exactly what he was saying and I’ll bet you a dollar against 27 doughnuts he knew the market would react negatively. You cannot have his resume and not know exactly what the market would do given his quite careful press conference. This makes me think Powell is perfectly willing to walk away from that unofficial third mandate. Is he letting his inner Volcker show just a little bit? If so… damn, Skippy, it’s about time! The Federal Reserve should be just as concerned about Main Street as it is about Wall Street. The serial bubbles of the last 30 years all had serious negative consequences. Yes, the ride was often fun, and some of us made good money in both the up and down cycles. But Main Street would be better served with a steady-as-she-goes Fed policy. Wall Street (and the financial world in general) should create earnings and value companies based on those earnings, and not game the system to the point where valuations get incredibly stretched and then the bubble pops. It kills the average investor who buys late in the cycle and then gets scared out of the market at exactly the wrong time. People come to see investing as a game Wall Street plays for its own benefit. In fact, it is anything but a game. To most people, investing is about retirement and life. How will we know if Jay Powell is serious about his inner Volcker? In Texas, we would look to see if he “crawdads” on us. Let me explain that. I grew up in West Texas where farmers and ranchers would create “tanks” or ponds to catch and hold rainwater for the cattle to drink. Little creatures we call crawdads (crayfish in more polite circles, which look like tiny lobsters) would burrow holes around these tanks and live happy little crawdad lives… until some young kid would come along, throw a piece of small bacon with a string attached to it in front of their home. When they would come out and grab the bacon, you would jerk the string, put the crawdads in a bucket and sell them to strange adults who would pay you a nickel apiece. Just for a silly crawdad. Later in life, I learned that crawfish etouffee is a serious meal in Louisiana and much of Texas. Next time you go to Pappadeaux’s, order the crawfish etouffee. It is not cholesterol friendly, but it is really good. But back to the main plot: When crawdads sense danger, they start walking backwards (as in this video) to hide in their hole. Hence the term, “Are you crawdadding on me?” Meaning, “Are you backing away from what you said or want back what you gave me?” It was generally not said in a polite manner. To crawdad on someone meant you broke your word. If Powell lets the markets fall and doesn’t crawdad on us without coming back and giving a speech essentially saying “I’m sorry, I really meant to be more dovish,”, then we will know he really wants to end the third mandate. That would make me stand up and applaud. Loudly and with enthusiasm. That being said, if Powell really sticks to his guns (I know I’m mixing metaphors here), then the United States and the world will be better in the long run—especially if his successors at the Fed do the same. They should politely take the president’s call, ignore the tweets, and set their own independent course. Will there be a time to cut rates? Absolutely. And I fully expect Powell to do it when unemployment starts to rise or inflation rears its head. But not because of some tantrum in the %#$! markets. That is not the Fed’s mandate. And now, let’s look at an abbreviated version of my recent webinar. As a preface, I think I have a pretty good record calling major economic and market turns. My weakness is timing. I tend to be early and, as I mentioned last week, miss some opportunities near the top. My solution is to separate my own outlook from my portfolio decisions. Using multiple, systematic trading systems seems to work better, which is why I’m in business with Steve Blumenthal. However, the annual forecasting exercise still helps. It forces me to review the data and identify the key issues that will affect my investments. Then, as the year unfolds, I can watch what actually happens and compare it with what the machines are doing to my money. When they’re not in sync, I can more intelligently evaluate why. This gives me more confidence in the systems and helps me stick with them through the inevitable bumps. The end result is better investment results over the long run. So, this isn’t just academic thought or entertainment. It matters to your and my money. What follows is a mix of my own thoughts as well as Steve’s. We’ll look at three topics: recession probability, credit conditions, and stock valuations. We went deeper on the webinar. You can read a transcript or view a recording here, which is about three times as long with more charts. 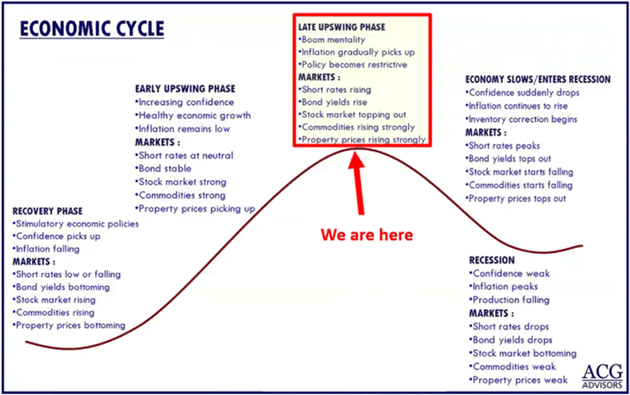 Steve started the webinar by noting we currently sit late in an economic cycle. He showed the chart above to illustrate how all cycles have expansion periods and end with recession. The longest expansion cycle (1991–2001) lasted 10 years or 120 months. The average since 1854 is 40 months and then recession, then expansion, then recession. The 2001 post-recession recovery lasted 80 months—ending, of course, with the Great Recession. We are 114 months into the current expansion, the second-longest in US history. Again, a recession is coming. The question is when. This expansion will break the record if it persists through 2019. If recession strikes next year, then what? Aside from the layoffs and business problems, the stock market declines on average about 37% in recessions. The last two saw 50% drops. If you think your buy-and-hold portfolio can ride that out, everything we know about behavioral finance says you are probably wrong. 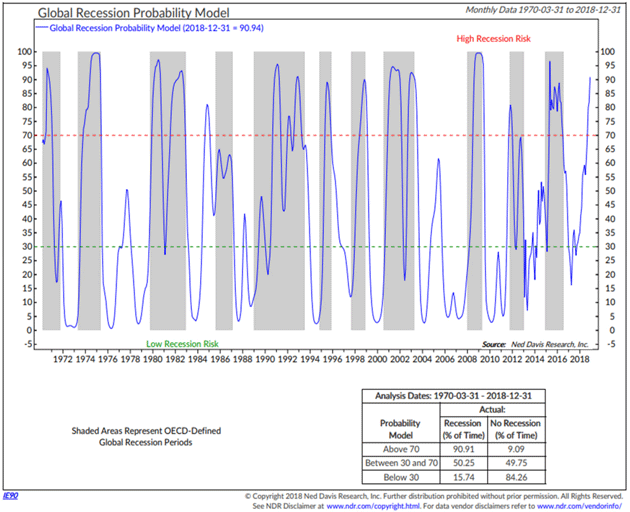 Steve watches an indicator from Ned Davis Research called the Global Recession Probability Model. I want to thank them for letting us use this. This model measures leading indicators across 35 countries, things like money supply, yield curve, building permits, consumer and business sentiment, share prices, and manufacturing production. It’s done a good job at calling recessions, shown in the gray bars. Any reading above that red dotted line of 70 is the danger zone. When that’s occurred, over 90% of the time we’ve been in recession. 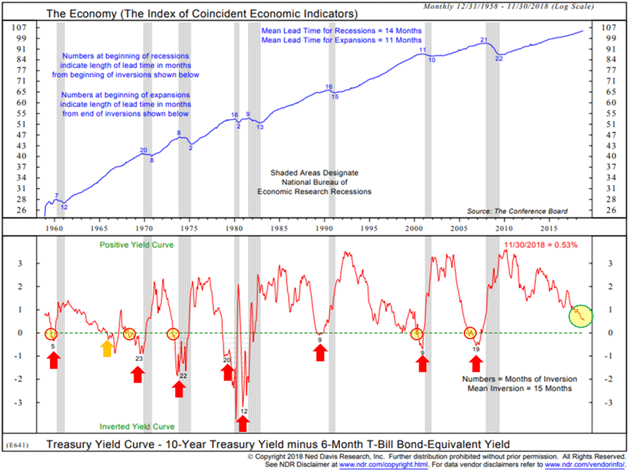 On the webinar, I pointed out that on this very useful chart, the indicator doesn’t just indicate a coming global recession. It says we’re in one. Economists identify them in hindsight. We only know we’re in a recession when we look back over the past data. So, the gray bars don’t appear in real time. They get added later. There was a point in 2000 that we were in a recession for just one quarter. It was three years later they tell us this. Now, it didn’t change anybody’s trading when they announced it and few noticed because it was three-year-old news. But it illustrates that economists are pretty bad at actually recognizing recessions in real time. We could find out in late 2019 that a recession began sometime the prior spring. However, that NDR index is global, and we know the US economy is doing better than most. This next chart is US-specific and the lower section shows the year-to-year rate of change in their Employment Trends index. 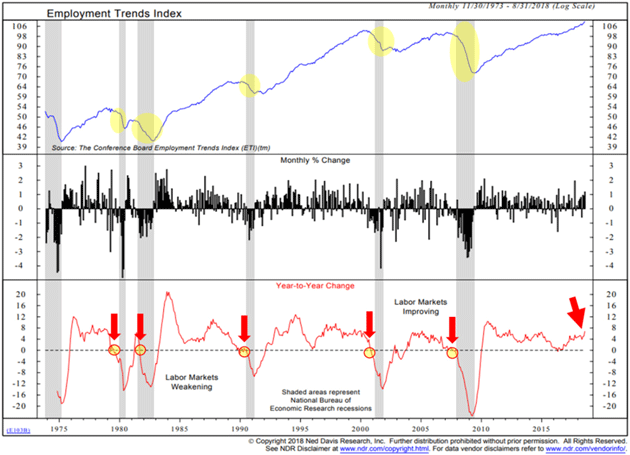 Note how when employment trends have declined, recession (gray bars) followed. So, recession risk is highest when this index’s yearly change is below zero. Conditions are currently favorable, with low recession risk. As you’ll notice, the yield curve nearly always turns positive before we actually go into recession. I know this from painful experience. As I related last week, I called the last recession after the yield curve inverted and the markets promptly went up 20% more. As of now, portions of the yield curve are flattening. It looks like the beginning of an inversion. The Fed seems aware of it, too, as we learned this week. Unfortunately, recession isn’t the only risk we face for 2019. I’ve talked several times this year about corporate debt and it just keeps growing. 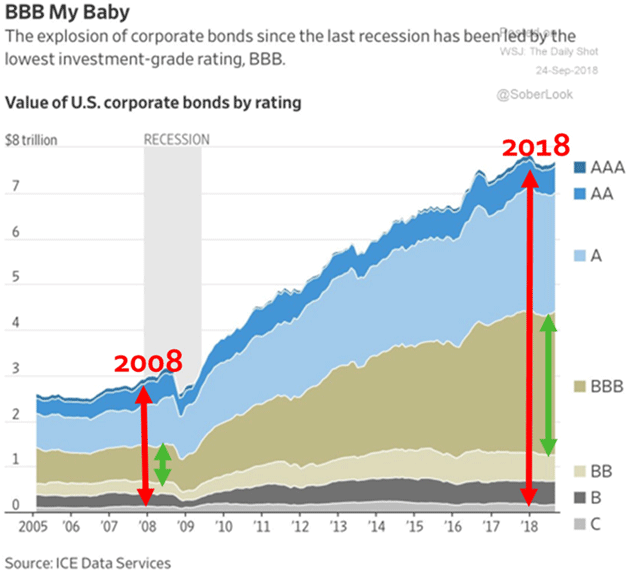 The corporate bond market is roughly three times bigger than it was in 2008. Worse, quality is dropping as quantity increases. In 2008, the US had about $3 trillion in corporate bonds outstanding. Now we have far more than that just in the BBB ratings or below. This might be tolerable if corporations were, as a group, highly capitalized with fortress-like balance sheets. Some are, but a dangerously high number are not. Yield-hungry investors have been throwing money at companies, which they naturally accept but don’t necessarily use wisely. Some large companies live on borrowed money and don’t have the reserves to survive long without it. Having said that, such problems are not widespread yet and won’t necessarily become so in 2019. Here is another Ned Davis chart. Look at the lower portion, their Credit Conditions Index. 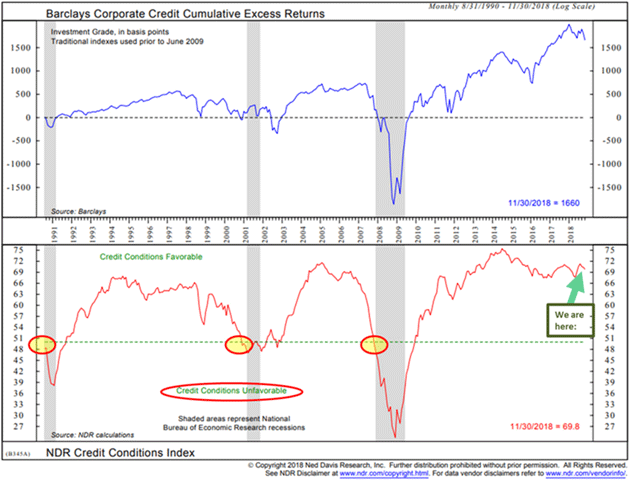 A dip below the green dotted line signals the kind of unfavorable credit conditions that would mean trouble for leveraged companies. As Warren Buffett famously said, that’s when the tide goes out and you see who’s swimming naked. The last three times happened near the beginning of recessions. Presently we are far from that point. On the other hand, notice how fast the index fell right before the last recession. It could change considerably by this time next year if the Fed tightens too much, or federal deficits “crowd out” capital from the corporate markets, or some other stressful event occurs. So, while this looks okay for now, it is important to watch, which Steve does. Finally, let’s get to what is most important for investors. Are your stocks safe? The quick answer is stocks are never safe. If safety is the priority, you should probably consider something else. Stocks are a “risk” asset. The real question is whether the gains adequately pay you for the risk you are taking. The higher the valuation, the less you are being paid. That makes this next chart disturbing if you’re long stocks. 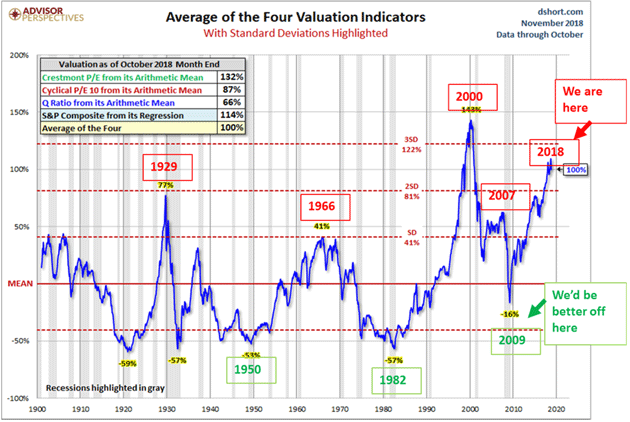 We see here four popular valuation measures, the average of which crunch to the second-highest stock valuations since 1900. The highest was in 2000. We are much higher now than in 2007, which led to a 55% peak-to-trough decline. That kind of decline won’t necessarily happen next year, but it’s all but certain within ten years. So this may not be a “sell” signal, but it sure looks like a “don’t buy” signal. And even with the recent drop, I would not bring a “buy the dip” mentality to my investment selection today. Note the bottom section of the chart where it says, “We’d be better off here.” That’s what a buying opportunity looks like. Buying opportunities happen at the bottom of the cycle when everybody is scared. That’s true for stocks, high yields, real estate, and everything else. When people say they’re worried about holding cash, I remind them cash is an option on the future. It’s not earning very much right now but could potentially earn a lot more when you buy at the bottom. I’m not looking at this and panicking at all. I’m rubbing my hands at the coming chance to buy solid assets cheap. It’s time to hit the send button. I will follow up this letter next week with my final year-end thoughts as we look to a brand-new 2019. Between now and then, my best to you and your families and friends, and here’s wishing you the best of the holiday season. The best gift I get is the time you graciously spend reading Thoughts from the Frontline. Thank you so very, very much. Let me give you a small gift that may help lift your spirits as well. My favorite version of the famous Christmas song, Have Yourself a Merry Little Christmas, was done by Frank Sinatra, who, as Judy Garland did before him, asked the original songwriter to make the lyrics more upbeat. Judy Garland used Sinatra’s version of the lyrics later she did her TV special. You can watch the Chairman of the Board himself sing that song here. For nostalgia buffs, look at the personalities in the audience. And if you really like nostalgia, go to the 1:54 mark in this video for Bing Crosby, later joined by Sinatra, singing I’m Dreaming of a White Christmas like nobody else has ever done. It really will make your heart a little lighter. ANDRES MANUEL LOPEZ OBRADOR, who became Mexico’s president on December 1st, knows how to put the romance into a honeymoon. On December 13th thousands of people attended a free moonlit screening of “Roma”, a Mexican film tipped for an Oscar, next to the heliport of Los Pinos, the residence of Mexico’s presidents until Mr López Obrador took over. The culture ministry supplied popcorn and punch. Mr López Obrador, or AMLO, as he is known, has swapped Los Pinos for more modest digs and opened it up to the public. Rocio Bonilla, a retired civil servant, watched with her 86-year-old mother, who remembers the first presidential occupant of Los Pinos, Lázaro Cárdenas, who took office in 1934. “I never thought I’d be allowed to come here,” says Ms Bonilla. While Mexicans huddled under blankets at the heliport, AMLO was making the sort of decisions that can eventually spoil a honeymoon. The veteran left-wing populist has begun to undo reforms of energy and education, the two landmark achievements of his predecessor, Enrique Peña Nieto. Before the inauguration he spooked the financial markets by saying that he would stop Mexico’s biggest infrastructure project, a new airport for Mexico City. At the same time he is travelling about the country launching others, including a tourist train in southern Mexico and a refinery in his home state of Tabasco. On December 15th AMLO presented a budget for 2019, giving Mexicans their first idea of the trade-offs he is prepared to make in pursuit of his “fourth transformation” of Mexico, which is supposed to uplift the poor, make the economy more self-sufficient and reduce corruption and crime. The budget shows that AMLO remains a populist, but that he hopes to be a fiscally responsible one. After the fright he gave the markets by cancelling the airport (in response to a spurious vote badged as a “consultation” of the people that he held before taking office), AMLO sought to reassure investors. The finance minister, Carlos Manuel Urzúa, set a target for a primary surplus (ie, before interest payments) of 1% of GDP after an expected 0.8% this year. Although AMLO had suggested that preventing corruption would result in massive savings, the budget does not rely on that unrealistic promise. Instead, he had to make some hard choices. He has scaled back his plans for higher social spending, although these remain ambitious. He is speeding ahead with high-profile infrastructure projects, which cost less money. And he is bringing back the idea that the state should provide energy that is abundant and cheap. He had planned to spend 125bn pesos ($6.2bn), about 0.5% of GDP, on scholarships for the young. That programme will get a little more than a third of that. The budget allocates 60bn pesos of new money for a universal pension for old people, 20bn pesos less than originally proposed. To help pay for these still-large programmes the government will slash elsewhere, in some departments by more than 20%. An overhaul of migration policy will get little money. Marcelo Ebrard, the foreign minister, announced spending of $5bn a year to discourage migration from Central America to the United States—partly to please President Donald Trump. This seems to be a repackaging of other promises to spend money in southern Mexico. The austerity will not affect AMLO’s favourite infrastructure projects. 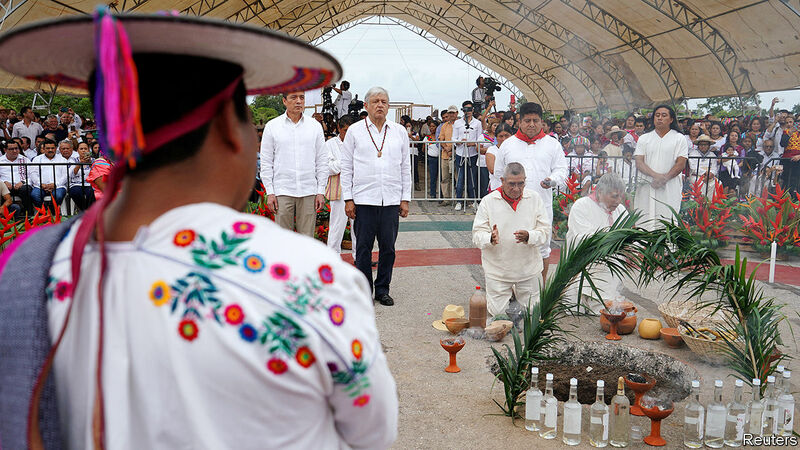 On December 16th he attended an indigenous ceremony (pictured) in which he asked “Mother Earth” for permission to build the “Maya” tourist train. (Mother Earth’s advocates in government have yet to be consulted. No environmental impact report on the project has been published; the budget cuts funding for the environment ministry by a third.) AMLO is eager to start work on the refinery. The budget includes 73bn pesos in extra funding for Pemex, the state-owned oil company, largely to pay for it. This is part of his expensive scheme to make Mexico self-sufficient in energy. AMLO’s government has not torn up contracts already agreed with international oil companies, an important part of Mr Peña’s energy reform. But it plans to freeze auctions of rights to prospect for oil and gas for three years. AMLO hopes to cut fuel prices once the new refinery is built. Pemex, which has a history of inefficiency and corruption, is supposed to raise oil production by 50% during his six-year term. Congress, which is dominated by AMLO’s Morena party and its allies, is debating measures to scrap Mr Peña’s education reform, which sought to enforce higher standards of teaching in Mexico’s terrible schools. AMLO wants to make education free at all levels. with international oil companies, an important part of Mr Peña’s energy reform. But it plans to freeze auctions of rights to prospect for oil and gas for three years. AMLO hopes to cut fuel prices once the new refinery is built. Pemex, which has a history of inefficiency and corruption, is supposed to raise oil production by 50% during his six-year term. The costs of reversing Mr Peña’s reforms will become visible only gradually. The government risks wasting billions in AMLO’s attempt to restore to Pemex some of the glory it lost when Mr Peña ended its monopoly of oil extraction. Cuts to fuel prices will eventually burden the budget. Weaker accountability for teachers will lead to poorer performance by pupils. The attempt to end the $13bn airport is causing immediate problems. Work on the doomed project continues, because the state-owned airport trust will have to repay $6bn of bonds when it is cancelled. It does not have the money, and AMLO does not want to pay out of the budget. Bondholders rejected an offer by the government to buy back a third of the bonds at a discount, and are unenthusiastic about a more generous offer. Until a solution is found, the cranes must continue to operate. Continued construction of the airport and AMLO’s conservative budget have soothed investors for now. But the calm may not last long. The budget assumes that the economy will grow by 2% next year, but some private-sector economists expect the increase to be smaller. A sharp drop in oil prices would upset the calculations on which the budget is based. Mexico’s supreme court has suspended a law that cuts the salaries of senior officials (including judges) and will rule in January on whether it violates public employees’ rights. That pay cut would not save the government much money, but it was a popular promise. The court could inflict the first big defeat on AMLO’S young government. If that happens, grab the popcorn. The history of humanity’s rise from savannah ape to masters of the planet is one of Faustian bargains. The agricultural revolution brought huge increases in population, but lowered living standards for many. What is true of productive systems is also true of ideologies. Of none is this more true than nationalism — an engine of both development and destruction. We need to recognise and manage both aspects of its personality — the beneficent and the diabolical. Nationalism is, above all, an extraordinarily powerful social force. As we were reminded by the commemoration of the 1918 armistice, tens of millions of people have fought and died in national armies, often willingly, since the beginning of the previous century. They died en masse for what Benedict Anderson called an “imagined community”: “imagined”, because the vast majority of its members are unknown to those whose national identity they share, and “community”, because it recognises a primary bond of loyalty and support. Such bonds cannot easily be inserted into the economists’s framework of utility maximising rational individuals. They plug into something far deeper: nationalism is a secular religion that sanctifies the idea of the nation. Human beings are intensely social. It is entirely natural for them to identify with something larger than their individual selves. Initially, however, these communities were both small and familial. Most of our subsequent political entities did not expect their subjects to feel a close identity with the state: they mainly demanded obedience. The mobilised nation state and the intense identity it promotes are roughly a product of the past 200 years, although, in the west, they echo the values of the ancient city states. Our modern starting point might be the levée en masse (mass conscription), brought in after the French Revolution. The late British-Czech philosopher Ernest Gellner made striking contributions to our understanding of the economic benefits of nationalism. Its essence, he argued, was the imposition of a culture of universal literacy in a common language, largely through a national system of education. This, in turn, demanded the creation of national institutions and supported the emergence of a national economy. This new ideology not only accompanied, but actively promoted, a more flexible way of life, while the old agrarian economy, with its yeoman farmers, serfs and feudal lords, faded away into history. Nationalism was one of the midwives of industrialised modernity. A modern nation state has benign, less benign and malign consequences. Among the benign is the emergence of a populace with a shared language and so able to co-operate more easily and move more freely among economic activities. Moreover, the new emphasis on a shared culture and national identity led quite naturally to demands for democracy: if everybody was a full member of the national community, surely everybody also deserved a voice in its destiny. And, as a consequence of the combination of nationalism with democracy, the welfare state arrived. The latter insured people against the risks created by a dynamic market economy, in which livelihoods might disappear from one day to the next. But it simultaneously strengthened bonds of national identity. Among the less benign consequences is the opportunity for rent-seeking: how attractive it has always seemed to wrap the flag around one’s sectional interests. Those unfair foreigners — people cry — are undercutting virtuous fellow citizens. Yet something deeper than mere greed is at work. Their passport is the most valuable asset owned by most citizens of high-income countries. Inevitably, many dislike sharing it freely. That they see this in “identity” terms is natural, precisely because a passport is an expression of identity. Control over immigration is thus an unavoidable corollary of the democratic welfare state. Among the outright malign results of nationalism is the use of xenophobia as a path to power. The more economic outcomes diverge within a nation state, the more easily cynical politicians can persuade anxious citizens that their interests are being sacrificed to those of a “globalist” — that is, treacherous — elite and its foreign associates and servants. The view that those who think globally are traitors is not surprising. It is a natural result of national feeling. Since the middle of the 20th century, nationalism has gone global. In China, for example, we see the creation, for the first time in its history, of a Chinese nation state. It is no surprise, then, that it cannot deal well with its minority communities. In highly complex societies, such as India, creation of an overarching national identity is even harder. Today, we are witnessing the resurgence of malign nationalism across the west and, most significantly, in the US. We even have the spectacles of people promoting an International of nationalists. Meanwhile, the US secretary of state, Mike Pompeo, ridiculously, recommends co-operation and the dismantling of institutions that make it work. Nationalism is surely the strongest political force of our era. In its benign form — call this “patriotism”, if you will, as George Orwell once did — it is the foundation stone of the world’s most successful political entities. In its malign form, however, it is an enemy of the peace and co-operation on which our future depends. If we cannot contain its malign aspects, it will surely destroy us. In the name of "solidarity," eurozone reformers have continued to introduce new instruments for sharing risk across member states in the event of another crisis. But what the monetary union needs is not joint liability – and the unacceptable degree of moral hazard that would come with it – but rather risk reduction. FRANKFURT – Since 2010, many measures have been adopted to “crisis-proof” the eurozone. In addition to tighter budgetary rules and the start of a banking union, new efforts are underway to strengthen the European Stability Mechanism (ESM), which is now meant to serve as a backstop for the Single Resolution Fund (SRF). At a recent Eurogroup meeting, eurozone finance ministers agreed on reforms to allow fundamentally “sound” member states to access “contingent” ESM credit lines if they meet certain conditions, and for all sovereign-bond contracts to include collective-action clauses by 2022. With policymakers still debating whether to create a eurozone budget and deposit insurance scheme, we should consider what the reforms introduced so far might mean for the future. At issue is whether we want a monetary union in which member states are individually responsible for their policies, or one based on solidarity, complete with risk sharing and financial transfers. In accordance with the European Union’s solidarity principle, the reform has focused on introducing more safety nets and backstops, with a shared budget, joint unemployment and deposit insurance, and so forth. The assumption is that the more risks are shared, the more stable the eurozone will be. But this is a fallacy. In practice, the proliferation of new safeguards has introduced a high degree of moral hazard and created perverse incentives for governments and market participants alike. Under the latest eurozone reforms, the principle that those who assume a risk should be liable for it has been replaced by a principle of joint liability, implying financial transfers on an unprecedented scale in the event of a crisis. The current situation in Italy should serve as a warning to all those advocating risk sharing. Making matters worse, the sole focus on solidarity means that the eurozone’s real problems have gone unaddressed. These include high levels of public and private debt, weak institutions, overregulated markets, and still-incomplete balance-sheet corrections on the part of corporations and banks. The arguments in favor of expanded solidarity measures are unconvincing. Either risk-sharing instruments are unnecessary, or they can be deployed only under conditions in which they would undermine eurozone stability. Why, for example, should a “sound” eurozone member state need to obtain a “contingent credit line” unless it is harboring hidden weaknesses? Equally dubious are the justifications given for a shared eurozone budget. Is the purpose to stabilize the bloc in the event of shocks? Is it to make investments? Or is it to create financial incentives for domestic economic reforms? As to the first question, during its 20-year history, most of the eurozone’s shocks have been asymmetrical, centering on member states that pursued irresponsible policies. With the exception of the 2008 crisis, then, eurozone shocks have generally been small and self-inflicted, suggesting that the appropriate response should take the form of domestic policies to build more robust budgetary buffers. If the purpose is to provide investment funds, the EU budget, the “Juncker Plan,” and the European Investment Bank already perform this role. Europe’s problem is not a lack of financial resources, but rather a lack of suitable projects and limited capacity within member states. Finally, the argument for a joint budget to reward domestic economic reforms assumes that such reforms create large-scale financial burdens in the short term. But the empirical evidence for this is inconclusive. In any case, the costs of not carrying out necessary reforms would have to be offset against the costs of doing so, if only to make clear that structural reforms are in individual countries’ own interest. A eurozone deposit insurance scheme is similarly ill-advised at this time, given the scale of non-performing loans in many member states. The immediate need is for a drastic reduction of existing balance-sheet risks. As for future risks, the preferential regulatory treatment afforded to government bonds must end. Sovereign debt should come with equity backing, and emissions of government securities should be capped. Rather than install ever more safeguards, it is time to address the eurozone’s real weaknesses. The sovereign-debt crisis started with weak fiscal positions and doubts about the sustainability of public debts, combined with structural deficits that led to a loss in competitiveness. Economic reforms therefore remain essential. Unless the risks emanating from high public debt are systematically reduced, eurozone countries will be heavily exposed when the next crisis strikes. Moreover, budget rules should be made more transparent, credible, and enforceable through automatic sanctions against conduct displaying a lack of solidarity. The focus on “structural deficits” should be replaced by a simpler spending rule that is less dependent on the economic cycle. And an independent and credible European fiscal agency should be entrusted with budget monitoring and the implementation and enforcement of the rules. The highly politicized European Commission does not meet these requirements. The eurozone also needs an insolvency code, which would restore credibility to the Lisbon Treaty’s no-bailout clause. And, of course, the nexus between governments and banks should be broken without further delay. In view of this agenda, the latest reform efforts are a step in the wrong direction. Joint liability in the name of solidarity will quickly become a one-way street for governments that pursue imprudent economic policies to escape accountability. And, given the eurozone’s high level of public debt, joint liability entails enormous financial risks. The limits of the eurozone’s solidarity policies are now being tested. The proliferation of backstops not only prevents risk mitigation, but actually invites even more risk. 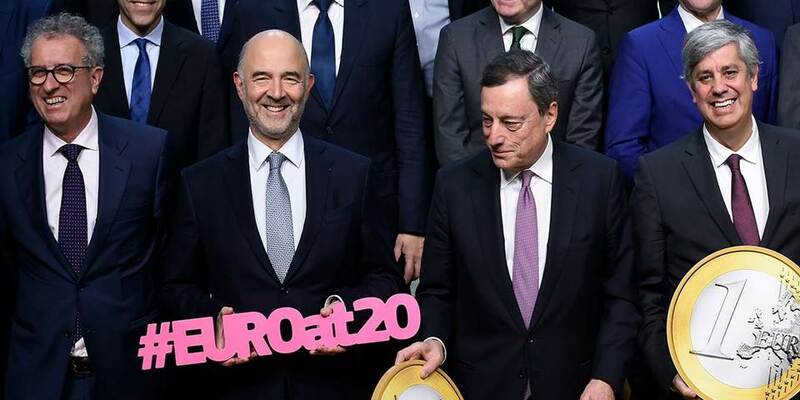 In the event of a crisis, governments’ incapacity to assume this collective burden will be laid bare, with far-reaching implications for the sustainability of public finances and the financial and monetary stability of the eurozone. Needless to say, the entire point of reform is to prevent such a scenario. For Europe’s Economic and Monetary Union to be secure, risk sharing must give way to risk reduction. Jürgen Stark is a former Member of the Executive Board of the European Central Bank and former Deputy Governor of the Deutsche Bundesbank. 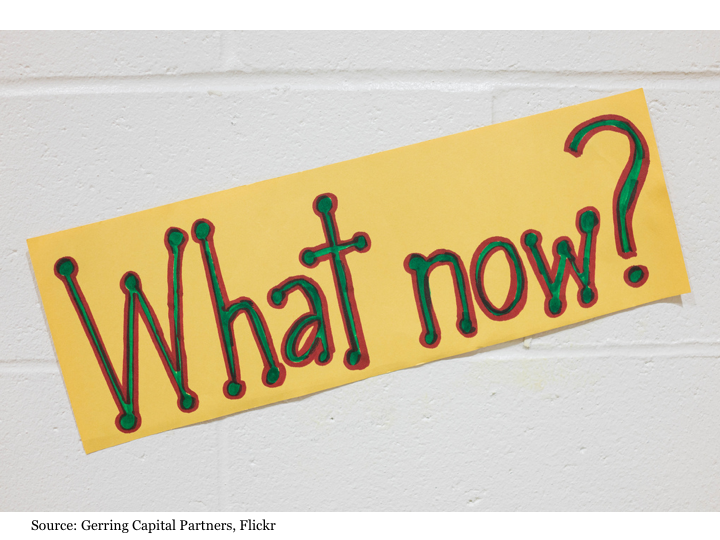 - Exploring "what now" after a heck of a week. - Perspective on technicals and fundamentals. - What's next and thoughts on what to do when next finally comes? It was a heck of a week. The S&P 500 Index dropped this week by more than -7%, which marked its worst weekly performance in more than seven years. Following this drop, the benchmark index closed the week at more than -9% below its ultra long-term 400-day moving average. Put simply, it looks and feels ugly out there right now. So what should stock investors reasonably expect going forward from here? I’m no bull. Before going any further, it's important to emphasize that I remain long-term bearish on the U.S. stock market. I believe stock market consequences will ultimately have to be paid for years of recklessly aggressive monetary policy and massive sovereign and corporate debt accumulation that inflated asset prices well beyond sustainable levels. But just because I'm bearish on the stock market over the intermediate term to long term does not mean that I think all of this payback will happen overnight. That’s simply not the way that the stock market cleansing process works (even the onset of the Great Depression and Financial Crisis unfolded in various fits and starts over a reasonable period of time). On technicals. The S&P 500 Index is now -17.83% lower through Friday from its all-time high exactly three months ago on Sept. 21, 2018. This is a lot of downside over a very short period of time, which of course is the type of elevator going down declines that can take place when a stock market is trading at historically peak valuations. In the process, the S&P 500 Index has set a lower low after reaching a new all-time high and in the process has fallen back to levels last seen nearly a year and a half ago in July 2017. But with all of this being said, the following also must be considered. First, its trading more than -9% below its 400-day moving average effectively matches the maximum downside gap reached during previous corrections on Oct.3, 2011, and Feb.11, 2016. 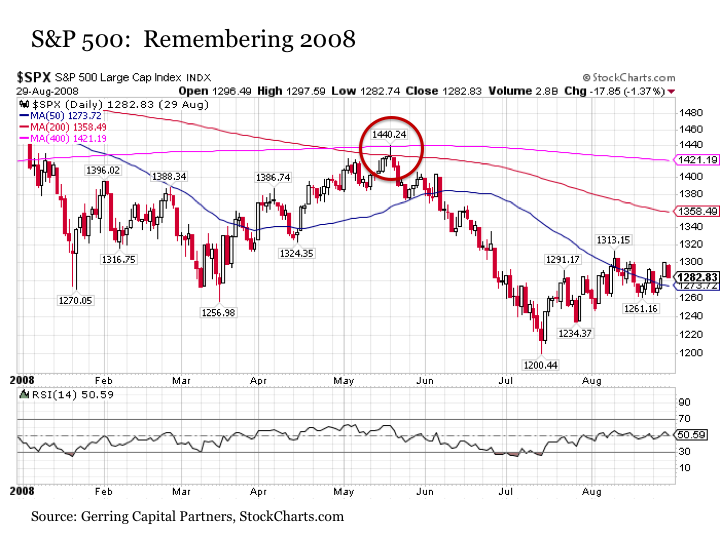 For what it’s worth, it also matches the initial downside breaks below the 400-day moving average before hitting a short-term bottom both on Dec. 20, 2000 and Jan. 22, 2008. In short, the stock market historically only goes down so far on its initial downside move, and we are currently at this threshold. Also, the Relative Strength Index on the S&P 500 Index now stands at 22, which marks one of the lowest readings in the post crisis period. Given that any reading below 30 is considered oversold, the S&P is overdue for even a short-term rebound at this point. 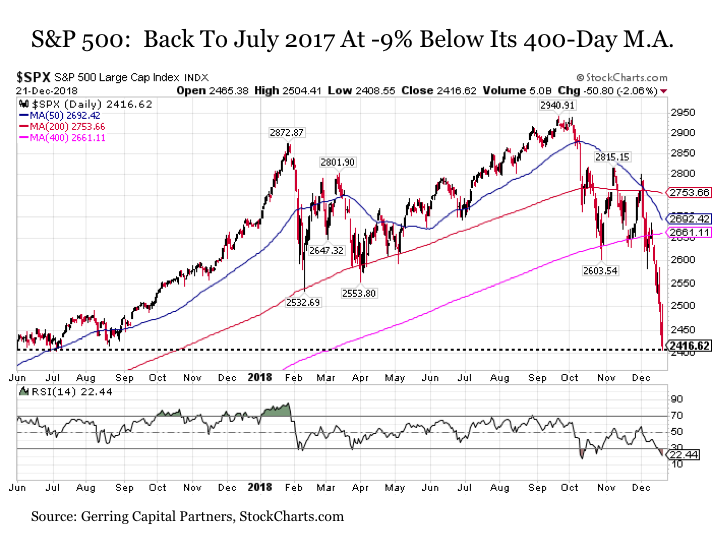 Furthermore, it should be highlighted that the 200-day moving average (the red line in the chart above) is still trading well above the 400-day moving average (the pink line in the chart above) even in the aftermath of this current market decline. It's also important to note that the 400-day moving average is still solidly upward sloping. These points suggest that we are at the very early stages of any sustained downside move at this juncture and that bounces are likely to occur in the short term even if they end up being to lower highs than before. So while considerable damage has been done to the S&P 500 charts during this ongoing correction, the magnitude of the damage sustained thus far is reaching various readings and historical extremes that suggest some sort of short-term mean reversion is likely and overdue at this stage. A final editorial point before wrapping up the technicals. If the S&P 500 Index ends up falling another 2.17 percentage points in the coming days and weeks and ends down -20% or more from its all-time highs before rallying, this may meet the often cited quantitative measure of a bear market, but it would not be what I would consider a true bear market. Instead, it would be nothing more than a scratch or a flesh wound at this point. Why? Because bear markets aren’t shorter than the shelf life of most fresh dairy products at the grocery store. Bear markets are long lasting over the course of at least a year, if not a couple more, and put investors through some repeated pain and reflection before they are all said and done. It may end up being the start of a bear market, but it wouldn’t be a bear market in and of itself. On fundamentals. While the U.S. stock market has been issuing a foreboding signal about what may lie ahead for the domestic and global economy, to date the underlying economic and market data remains sufficiently strong that a meaningful short-term bounce in the S&P 500 Index cannot be ruled out. For while we have certainly seen some renewed weakness in the housing market data in recent months, it's also worth noting that other key drivers such as real personal consumption expenditures and real corporate earnings growth remain solidly positive. Moreover, the unemployment rate remains at cycle lows with no initial signs yet of turning higher. Dissecting earnings growth one step further, it's particularly notable that GAAP earnings forecasts that are still projecting double-digit positive growth for the coming quarters have experienced only relatively minor downward revisions since late September over the course of the current stock market correction. The same can be said of a number of key economic forecasts. If underlying economic and market conditions are on the brink of falling apart, it's not necessarily showing up in downwardly revised growth and a number of key earnings forecasts. Such prognostications have a history of being notoriously wrong, so perhaps this will ultimately change. But in the meantime, as long as this data holds up, it remains supportive of a short-term bounce. What’s next? Let’s say the stock market finds a bottom and starts to bounce in the near term. The next and perhaps more important question is what to do with this bounce. First, the bottom line. If you are overweight or even neutral weight to stocks in your portfolio strategy, any short-term bounce should be viewed with an eye toward profit taking and dialing back allocations on the margins (in other words, don’t sell everything at once. Instead, consider selling off the least conviction names and continue to hold the rest). This way, even if stocks blast back through the 400-day moving average in early 2016 style, you will still be allocated to participate but you will have dialed back risk exposures in the event that the broader market fails and turns back lower instead. Next, the levels. Right now, if the S&P 500 Index finally bottoms and starts to rally in the near term, the key level to watch is its 400-day moving average currently at 2661 and rising at a decelerating rate. This alone would be a healthy 10% bounce from current levels. Historically, a common development once such a bounce takes place is that stocks will rally back to the 400-day moving average, only to subsequently fail and fall back further to the downside. To illustrate this point, a comparable chart from 2008 is shown below. Notice how the S&P 500 Index rallies from its March lows that are well below its 400-day moving average through mid-May where it reaches as far as the pink line before falling back to new lows. An important additional level also must be considered. At this stage of the correction, the 50-day moving average (blue line in the earlier chart) is dropping like a stone and appears poised to cross below the 400-day moving average. If this takes place by the time that stocks finally bottom and start to bounce, expect stocks to struggle at this key medium-term technical level. Lastly, the action. If you are seeking exit strategies from selected equity allocations in your portfolio, it's upon arrival at these key technical levels for the broader market – the 400-day, the 50-day, and also include the 200-day moving average – that an investor should be looking to pull the trigger on any reductions in stock allocations. The bottom line. It was a bad week for stocks and the latest in a long line of bad weeks stretching back over the past three months. While the long-term outlook for stocks may be murky, short-term technicals and fundamentals suggest that a measurable rebound back to the upside could still take place in the short term. It remains important to stick to your investment philosophy and program despite this recent volatility, but if you are inclined to strategically lower your allocation to stocks in the wake of this recent correction episode, look to use key technical levels such as those detailed above to help determine exactly when it's time to send selected stock names to the exits. French President Emmanuel Macron has tried to calm protesters by raising the minimum wage, among other concessions. But if the yellow vests continue eroding his authority, it's not just France that will suffer. And Germany is partly at fault. Famed German political sociologist Max Weber once argued that the two great drivers of revolutionary power were charisma and rationality. Charisma depends on enthusiasm, rationality on intellectualization. According to this blueprint, Emmanuel Macron would seemingly be the ideal revolutionary. He combines charisma and intellect like few others and believes in the need to change France, Europe and the world. The book about his campaign is called simply: "Révolution." Macron sees himself as a know-it-all in the best sense of the term, but precisely that is also his greatest weakness. Nowhere did Weber write that charisma and intellect magnify each other when combined. A glance at the trajectory of Macron's popularity in France might lead to the assumption that the two qualities cancel each other out. Can a charismatic leader be a know-it-all? Can a know-it-all have charisma? Many French people now see Macron's election to the presidency as something of an accident. Emmanuel Macron had no party, little experience, and lots of luck. His political opponents destroyed each other. Indeed, polls show that far less than half of Macron's voters in spring 2017 voted for him out of conviction. The rest of his voters, though, indicated that the other candidates, Marine Le Pen first and foremost, were simply unelectable. Luck is not a factor in Max Weber's discussion of charismatic rulers. Macron, who suddenly became head of state at the age of 39, first needed to develop his authority. And he did so with a clear strategy, setting out doing so with single-minded determination, seeking to develop charisma through images and symbols, and to carry out his revolution through shrewd argumentation. He put himself at the epicenter of French politics. As a candidate, he was alone. And he remained so as president. But this over-personalization had its price. Macron's system relied on the complete centralization of power in the hands of the president and of a few intellectually gifted advisors, who sometimes send out text messages at 3 a.m., as Macron does himself. Macron's IQ-absolutism was successful in his first year. The furthest-reaching job-market reforms in recent French history, which he instituted in fall of 2017, didn't even lead to a general strike, as had been feared. Macron loosened the rules for firing employees and broke up the rigid wage-negotiation system. He simultaneously lowered the budget deficit below the 3-percent mark for the first time since 2007. He even modernized the sacrosanct French secondary-school diploma, known as the baccalauréat. Emmanuel Macron has already reformed his country more profoundly than all the presidents before him -- at least since Mitterrand, who implemented an important wave of modernization starting in 1983. Macron is proud of his reforms. Rightly so. He believes these reforms will bring growth back to France. Rightly so. He also believes that new growth in France will repair the social imbalances in the country. Rightly so. But Macron is forgetting about the span of time required between reform, growth and social justice. Many French don't want to wait. They want results. Immediately. The yellow vests don't have a face, but they have charisma. And they are united in anger. They want a revolution and they want more net income. They don't care what this might mean economically for their highly indebted country. They loathe the self-proclaimed revolutionary at the top, his aloof reliance on symbols, his know-it-all revolutionary rationality. Although the Élysée's arguments are technocratically coherent, the gilets jaunes confront them with brutal simplicity: If you abolish the wealth tax but raise the price of diesel by six cents per liter, you are an enemy of the people. One-and-a-half minutes into his address to the nation last Monday, Macron took a deep breath and addressed those whom he had forgotten: the single mothers, the job-seekers, the excluded. The mea culpa was followed by the checkbook, with Macron pledging to raise the minimum wage, introduce a tax exemption for overtime pay and lower social-welfare contributions for pensioners. It was a classic Macron moment -- empathy paired with technocracy, symbolism paired with facts, charisma paired with rationality. Can this approach work? Definitely. But only if Macron can win back his authority. The hatred of the yellow vests will not disappear immediately. On the other hand, though, the movement has no leverage to derail the Macron system. The government has confronted the violence of the demonstrators with severity, but no political movement has yet emerged. Even if such a movement were born, it would have no influence. Macron is relatively secure in the Élysée until May 2022 and he enjoys absolute majority in parliament. He has no coalition partners to keep happy and no reason to fear a no-confidence vote. Even if everything goes wrong, he can still use the same presidential sleight of hand each of his predecessors has used: fire the prime minister and call for a new start. Only very few constitutional systems provide the head of state with the luxury of an institutionalized scapegoat. Leaders with access to a political defense mechanism like that won't step down, even under the most severe political pressure. The gilets jaunes know this. The question now is whether they will insist on pursuing their 1789-style overthrow attempt. Macron has made it clear that he is looking for political debate and that he accepts all forms of democratic resistance. But the gilets jaunes see themselves as a revolutionary force. And precisely that makes them dangerous to Macron, despite his institutional power. As such, Macron has to hope that his concessions to low-earners find acceptance and open a path to political dialogue. But Macron also needs to open up. Initially, he focused on establishing his authority. Now he must focus on creating trust and developing acceptance of his chosen path of modernization. Merely staying in office won't be enough for his reforms to continue. For Europe, this is especially important: A weak French president who entrenches himself inside the Élysée Palace won't help anyone. It is in Germany's interest to support Macron. Macron's loss of authority at home can also be tied to his lack of support from the German government. Macron's visionary Sorbonne speech was answered by the German chancellor with a technocratic interview on Page Two of a national newspaper. In the negotiations over further integration of the common currency union, the German government skillfully dragged Macron's government so deeply into a technocratic debate over implementation that they spent several nights debating subjects like "single-limb collective action clauses," a specialized bond-condition variant. Thus far, Macron's attempt to jolt Europe awake has fizzled. Some officials in Berlin are pleased that the German government has taught the Sun King pragmatism. "He is strong with his vision, but we are strong in our implementation," it has recently been said in Berlin's government quarter. But Europe is more than a game of Monopoly, and the German-French partnership is a long-term project. How will Berlin react if Macron doesn't prevail and an alliance of the far-right and far-left EU-haters surrounding Marine Le Pen and Jean-Luc Mélenchon takes power in 2022? Have we learned nothing from the Italian crisis? Germany and Europe would now be well-advised to give Macron their support. If Macron fails, Europe fails. The French president's concessions to the gilets jaunes cost money. To start a debate now about deficit rules would be foolhardy. There is no better ammunition for Macron's opponents. We shouldn't forget that Germany didn't abide by the deficit criteria either when it instituted Agenda 2010, the package of welfare-system and labor-market reforms carried out between 2003 and 2005. From an economic standpoint, it is wise to accompany supply-side reforms with demand-side support, which is why the argument that a flexible approach to France should mean a flexible approach to Italy is irrelevant. In Italy, no serious reforms are being undertaken. Berlin must have an interest in strengthening Macron, because Macron's quiet decline damages Germany. It would throw France back years economically if the revolutionary power in the country ceased being its president. It might be helpful to remember not just Max Weber, but also Abbé Sieyès, the great theoretician of the French Revolution. In 1799, he wrote: "Authority comes from above, trust from below." This formula still applies today -- to France, but also to Europe. Henrik Enderlein is the president and professor of political economy at the Hertie School of Governance in Berlin as well as the director of the Jacques Delors Institute. It’s a bloodbath out there. The S&P 500 has plunged 11.3% this December. That’s good for its worst December since 1931. It’s also down 15.3% since the start of September… which makes this one of the worst fourth quarters ever for U.S. stocks. See for yourself. Notice anything about the other sell-offs on this list? They all occurred during a major economic or financial crisis. In other words, we could be in the middle of something much more serious than a routine correction. It’s better to be prepared for the worst than to be blindsided. So don’t wait for U.S. stocks to fall another 10% or 15% to take precautions. Act today. Here are four simple ways to do that. · Lighten up on your weakest positions. I’m talking about overpriced stocks and heavily leveraged companies. As I’ve said before, these are not what you want to own at this stage in the bull market and economic cycle. · Hold extra cash. This will cushion you against big losses should stocks keep falling. It will also give you “dry powder” to buy stocks when the next major buying opportunities arise. · Own physical gold. As we often point out, gold is real money. It has preserved wealth for centuries because it’s a unique asset. It’s durable, easily divisible, and easy to transport. It has also survived every major financial crisis in history. This makes it the ultimate safe-haven asset. Investors who take these steps will protect their hard-earned capital… and sleep better over the holiday break.